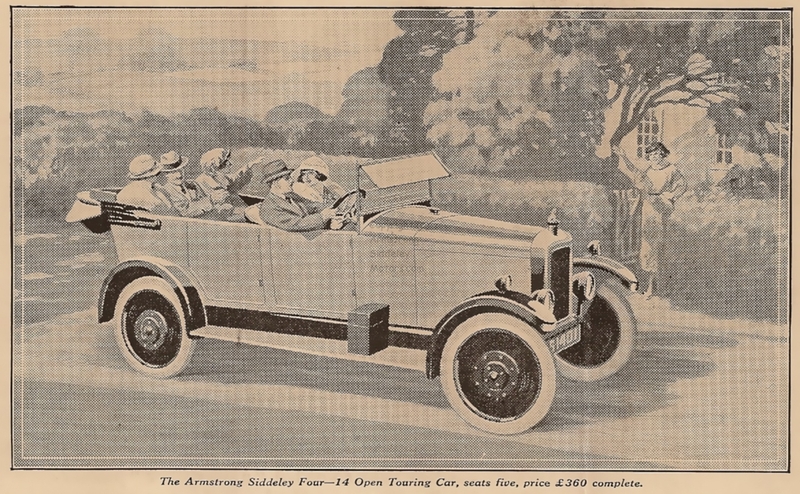 Armstrong Siddeley introduced the 14 HP car in 1923 as the lowest price model in the range. The most obvious distinguishing feature is the that it has a flat, rather than the V-shaped radiator used on the 18 and 30 HP cars. It also had a four cylinder engine and was initially only available with a touring body. 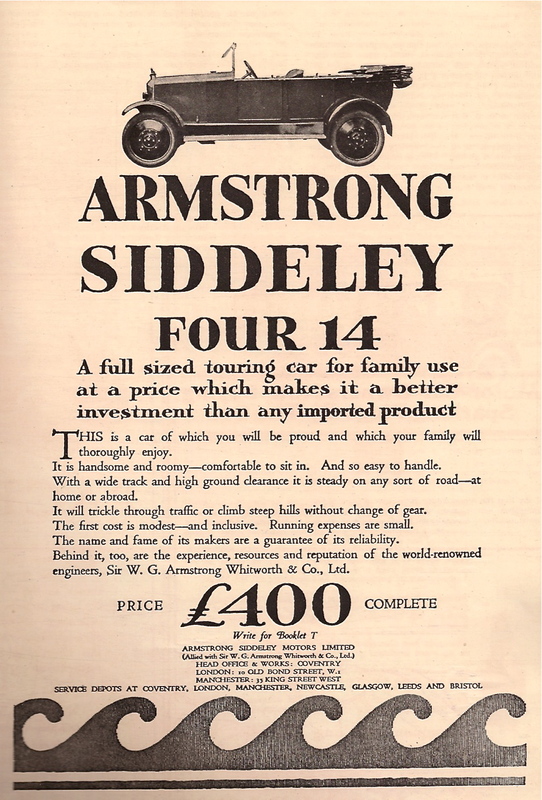 This is the Preliminary Announcement leaflet published by Armstrong Siddeley in July 1923 to promote the new 14 HP model. 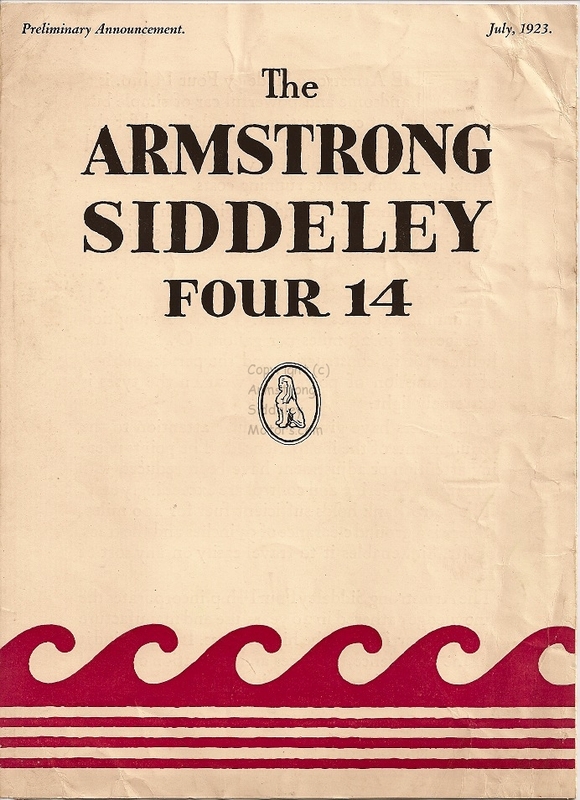 The leaflet described the Armstrong Siddeley Four 14 as “a full sized touring car for family use at a price which makes it a better investment than any imported product”. 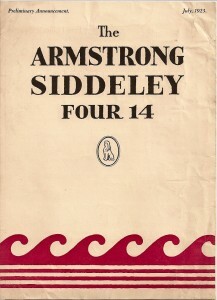 The leaflet went on to say “Equipped with a four-cylinder engine with overhead valves, it will climb most main road hills without change of gear, and run at a good average speed with a full load… Petrol consumption averages 26 to 28 miles per gallon… Its designers have given particular attention to the inexperienced. The points needing attention or adjustment have been reduced to a minimum. Steering and controls are exceedingly easy. The petrol tank holds sufficient for 200 miles.” The engine size was under two litres (1852cc). The price was 400 pounds, plus 25 pounds for special extra equipment. 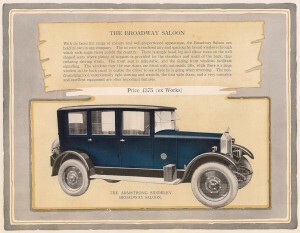 This is an early advertisement for the 14 horse-power car showing the tourer body. The advert stresses the wide track and high ground clearance, which made the car suitable for the poor roads in colonial countries. 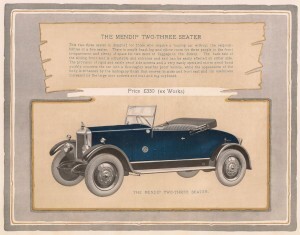 It also mentions the “name and fame” of its makers and “experience, resources and reputation of the world-renowned engineers, Sir WG Armstrong Whitworth & Co Ltd” – all designed to convey that this was a quality car even though it was much cheaper than the 18 and 30 HP models. 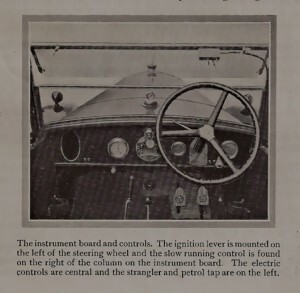 This is the view of the dashboard and controls from the instruction book for the Mark 1 Armstrong Siddeley 14 HP car. Note the central control, labelled Armstrong Siddeley, with the ammeter, ignition switch and light switch. The gear lever and handbrake are in the centre of the car. The petrol cap is on top of the scuttle-mounted petrol tank. The Sphinx sits proudly on the radiator. The 14 HP was usually advertised with a full complement of passengers to promote its family appeal. This is the image used by the company in July 1924. 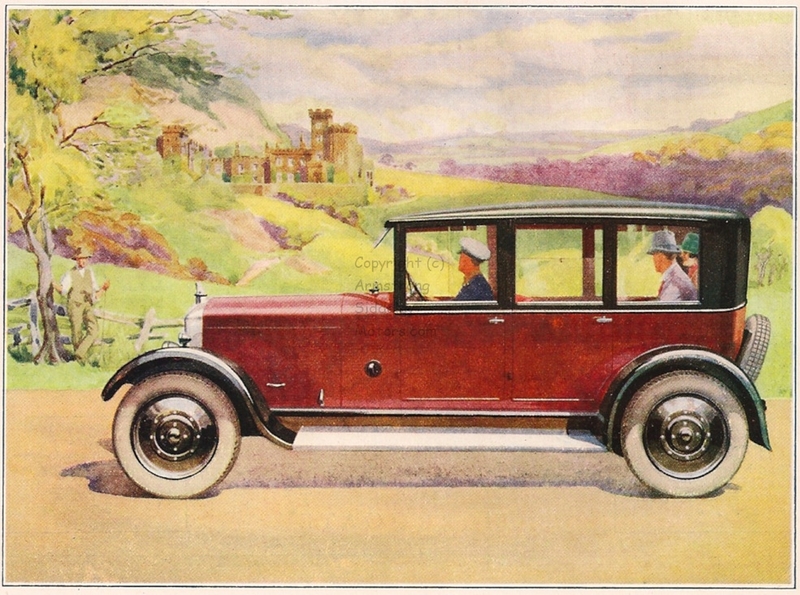 This may have been drawn by Guy Lipscombe, who was an early motoring artist employed by the Motor. He is particularly well-know for the famous First World War poster “Our Flag”. 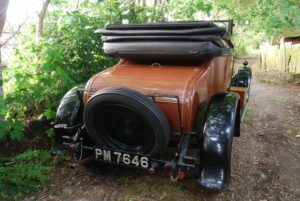 By 1924 the price of the basic tourer had been reduced to 360 pounds (though it was 385 pounds with additional equipment) and the 14 HP was also available with the following bodies: two seater and dickey (360 pounds), saloon (480 pounds) and Landaulette (505 pounds). 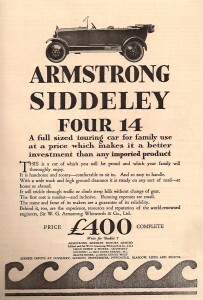 Armstrong Siddeley introduced the Mark 2 version of the four cylinder 14 HP car in 1925. This involved many improvements to the original design, particularly the introduction of a new chassis with four wheel brakes and semi-eliptic front and rear springs, to replace the cantilever springs used on the Mark 1 car. The improved chassis enabled the company to offer a wider range of body styles. These are the two coupe models: the Mendip and the Chiltern. The former was the lower cost model, costing 300 pounds, with room for two or three people. 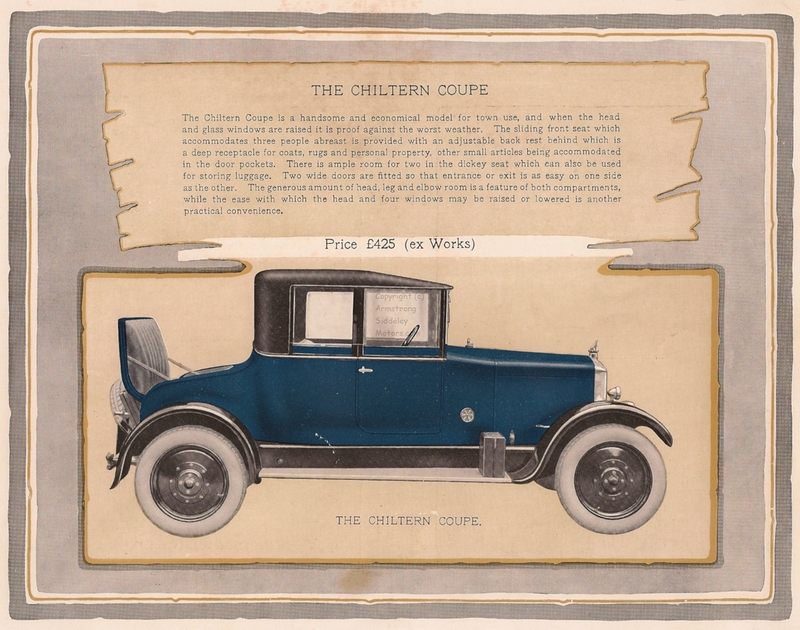 The Chiltern was a more expensive model, at 425 pounds, with a Dickey seat and leather hood. Both models are sometimes referred to as a “Doctor’s coupe”, reflecting the popularity of this design with doctors and other professions. These are the two tourer bodies available on the 14 HP chassis. The left hand model is the Cotswold tourer – a full five seater car which was supplied with a hood and side screens, as shown here. Most of the surviving vintage 14 HP cars have this popular body style. The Sandown tourer body cost 40 pounds more when new and was made in smaller numbers – I don’t believe any of these models survive to today. The Sandown was the nearest the 14 HP got to having sporting credentials, with sloping doors and a slightly more raked steering column. On the left is the Grassmere Three-quarter landaulette which had an opening section at the rear, probably with a leather hood, for the passengers to use in fine weather, while the chauffer remained in the open in all weathers; this model cost 425 pounds when new. On the right is the Broadway saloon, which was 50 pounds less at 375 pounds when new. 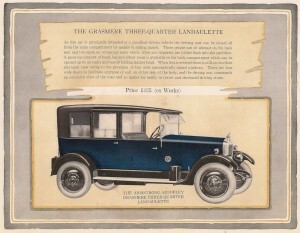 The Grassmere body gave the passengers plenty of headroom – so no problem wearing a top hat. 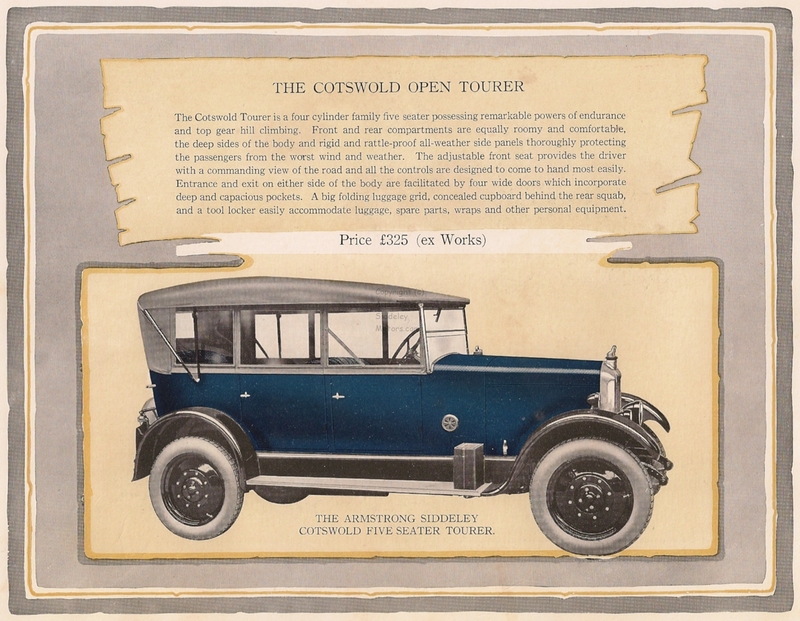 Armstrong Siddeley also made the Lynton saloon landaulette on the 14 HP chassis with an opening hood at the rear. This model cost 425 pounds when new. The saloons were quite noisy, especially when fitted with the crash gearbox, and they were heavy bodies for the chassis and engine size. The Chiltern coupe with the hood down. 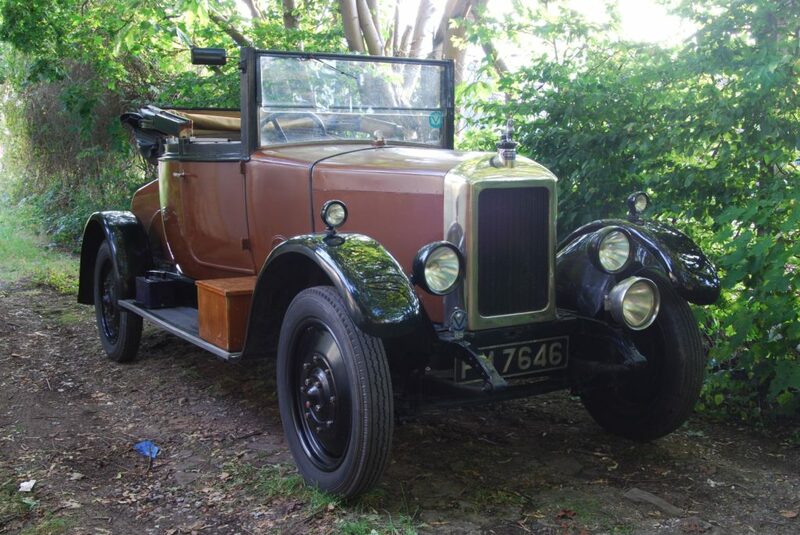 This 14 HP car dates from 1926 and is remarkably original condition, complete with leather hood. The body was made by Holbrook Bodies Ltd Coventry. Note how the original leather hood folds down; still in excellent condition in 2014 after 88 years. The dickey seat lifts up to reveal a simple seat. 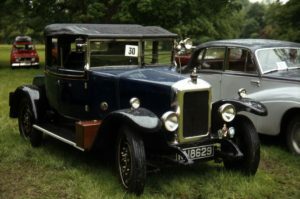 1926 14 HP Armstrong Siddeley with coach built coupe body by Salmons and Sons photographed at ASOC rally 1971-2. The pictures here are from handbooks for the Mark 2 cars: the left image from around 1926 and the right image from mid 1927. 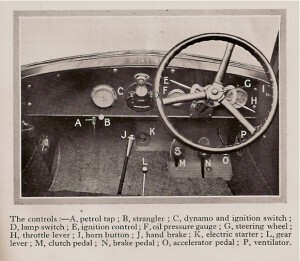 The controls are A Petrol tap, B Choke, C Dynamo and ignition switch, D Lamp switch for side and head lights, E Ignition control to advance and retard the magneto, F Oil pressure gauge, G Steering wheel, H Throttle lever, I Horn button, J Handbrake, K Electric starter, L Gear lever, M Clutch pedal, N Brake pedal, O Accelerator pedal, P Ventilator. 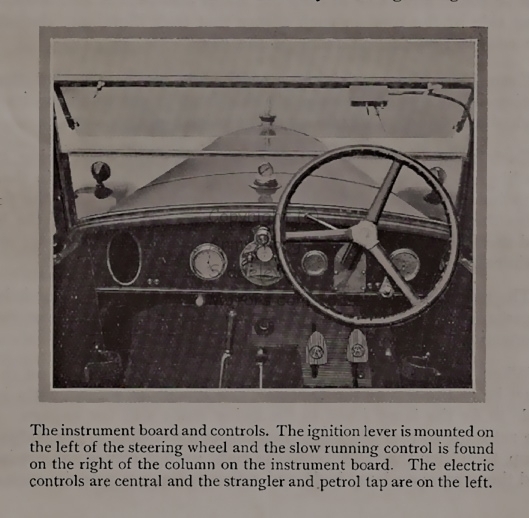 By 1927 the throttle lever behind the steering wheel had been replaced by a slow running control to the right of the steering column. 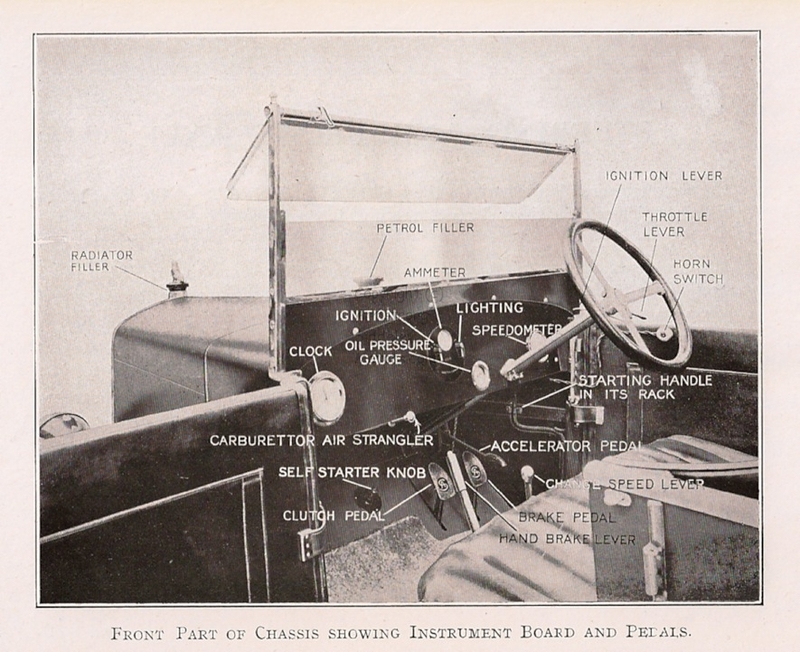 Also visible in this image is the petrol gauge on top of the scuttle-mounted petrol tank, the windscreen wiper on top of the windscreen, which was operated from the gearbox, and the Sphinx mascot on top of the radiator. 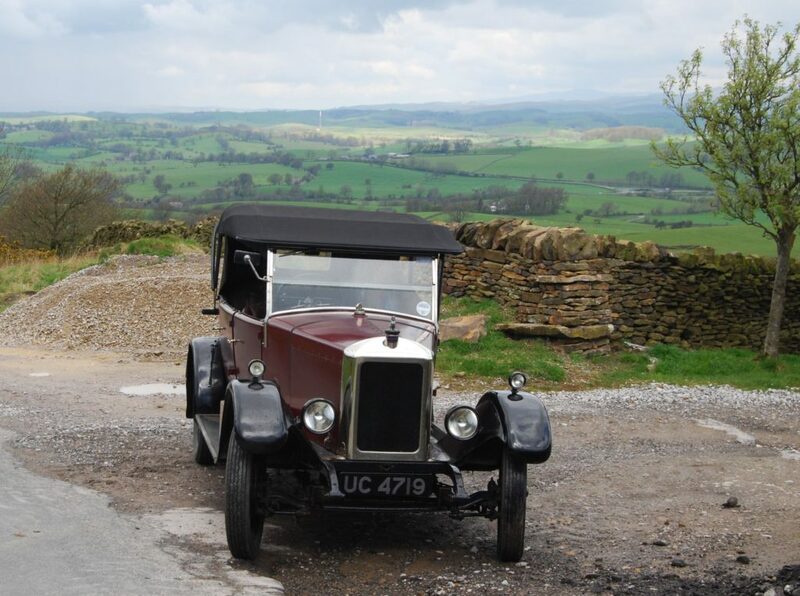 1927 Cotswold tourer photographed in North Yorkshire in 2012 with hood up. 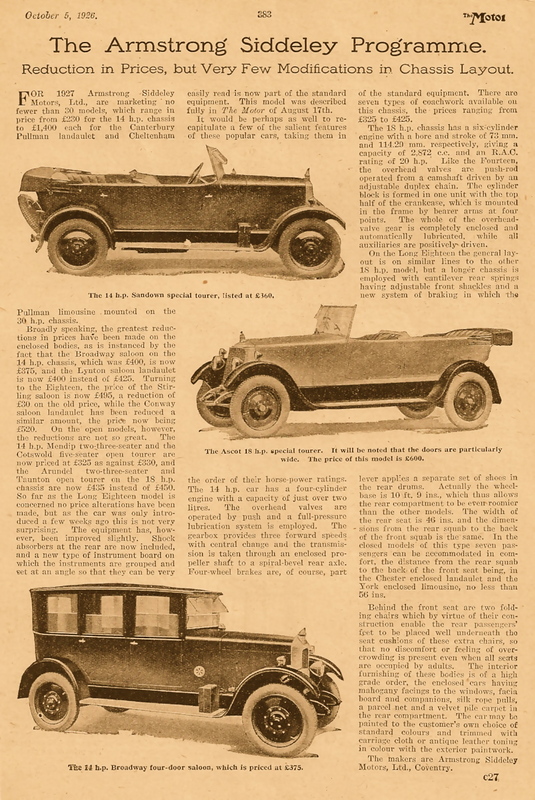 The 14 HP model featured prominently in the company’s announcement of the 1927 range of cars, here picked up in article in The Motor in October 1926. This is the Lonsdale saloon from an advertisement dating from around 1928 – chauffer-driven on a country tour. 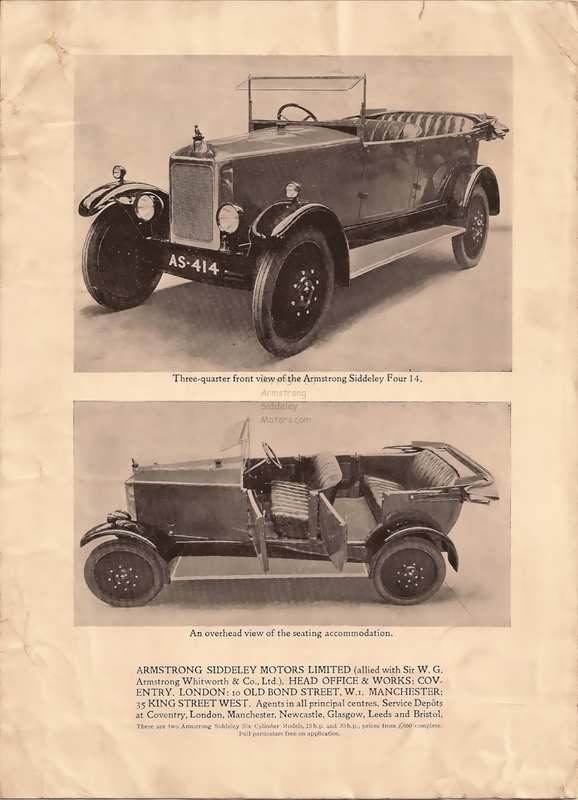 1929 was the last year that the four cylinder 14 HP was offered for sale and this catalogue shows the six cylinder 15 HP with the same range of bodies: 2-3 seater coupe, tourer, four light and six light fabric saloons, Weymann saloon with drop head, coach built saloon and coupe. These models were available on the short 20 HP chassis as well. It is well known that almost 14,000 cars were produced between ’23 & ’29. The lowest chassis number that I have heard of is 15666 and the highest 27390. Do you have any details of chassis range built in each year? One is often asked “What year is it” and it is difficult to give an accurate answer. Hello The firing order is 1, 2, 4, 3. Haar,does anyone knows what thecode DA or EA or FA stands for with the 14 HP 6 Cylinder 1666 cc engine? Hay,don’t know if you solvee your camshaft problem,but there is a shop in the Netherlands mail is info@inducam.nl. Hurksestraat 18-n 5652 AK Eindhoven. They weld the worn places and regrind it,after straitenong if needed. I don’t know about costs. My camshaft is badly worn to and I intend to let them do the job. Another shop in England is. http://www.newman-cams.com.fhey Can make a New one,for a 6 cylinder about 850 plunderen ex VAT. Hi Nick The instructions in the handbook are bring flywheel to top dead centre, i.e. the line with letters D C 1 4 two teeth to offside of the line of the rear valve stem. Note 0 on the crankshaft sprocket and turn camshaft sprocket until 0 on it approximately faces the 0 on the crankshaft. Move the camshaft until No 1 (front) cylinder inlet valve is just opening and then wind chain round the crankshaft and camshaft sprockets. When the chain is tight it will be found that the inlet valve in No 1 cylinder is beginning to open over tdc, exact distance being variable. You can tension the chain by rotating the dynamo. Do you want advice on timing the magneto? I time my car with fully advanced at 16 teeth before tdc. I’ve added a copy of the 1926 article on servicing and maintaining the 14 HP in the Technical section. Hi, has anybody a proper timing advice for a 12hp engine ( 1.434 cc ) ? The handbook says 1/2″ before No.1 cylinder is on top dead centre. That leads to 24? or 12 teeth o the fly wheel. This seems to be very early or not ?